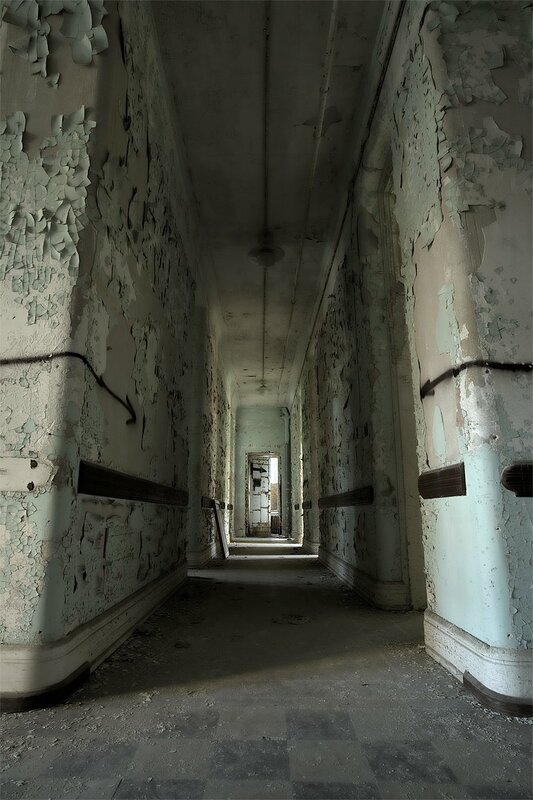 I had the opportunity to obtain access to the unrestored sections of Traverse City State Hospital this past week. It was a last minute deal, and we were very limited on time and available light, so I only managed to get a few shots before the sun set. The color images from this gallery were shot using HDR (high dynamic range) imaging - actually my first attempt at shooting using this method. I've been wanting to try this out, but never really had a good subject. Well, this worked. These images were shot in very low light, requiring exposures in the 20-30 second range. HDR images are essentially multiple images, shot through a range of exposures (light to dark), then merged together and tone mapped. The resulting images display a greater dynamic range through the highlights, shadows and midtones, over what you would typically see in a straight, single image. At a certain point, the light diminished to nothing, so we were forced to navigate through the sections using flashlights (or cell phones, after the flashlights died). At that point, I pulled out the infrared camera and took a few shots. The results were interesting, not the best photography, but would probably be entertaining to the "ghost" crowd maybe. I posted a few. It's damn near impossible to do much photography under zero light, with no flash or light source, but... as you'll see, I made due. My sleeping bear project is moving slower than I expected. I have a few models that I work with routinely, but I was really hoping to get more local people involved. My goal was to make this a very localized project - where I wouldn't have to bring people up from downstate or out of the region. Unfortunately, recruiting has gone slower than I expected, and additionally, one of our local newspapers is now refusing to run my advertising, which really hurt the process also. But, I guess that kind of stuff comes with the territory, unfortunately. I was in several of the buildings about 10-12 years ago with my father who used to work there. Most were unsafe, others just plain felt sad. The old hospital is a big part of my family history. Feels very odd to see some of it now being used as condos, but I'm glad actually to see some of it untouched. I think people need to see that to realize the things that have been done in the past are real, and not just stories the older folks tell us.